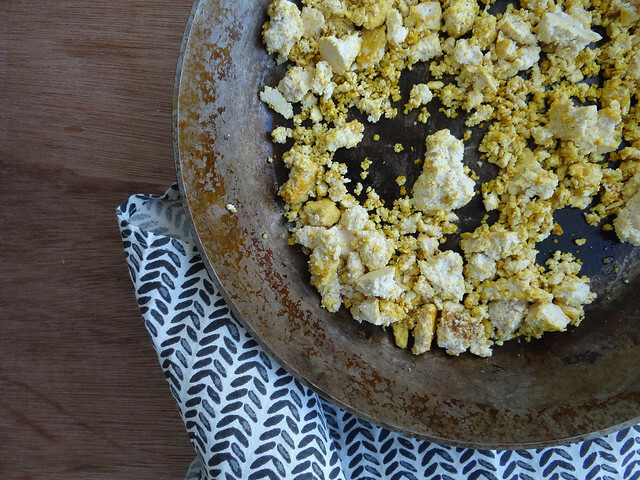 This isn't quite a recipe but rather a method - the base of the tofu scramble always remains the same, the add ins can be switched up by whatever you have on hand. 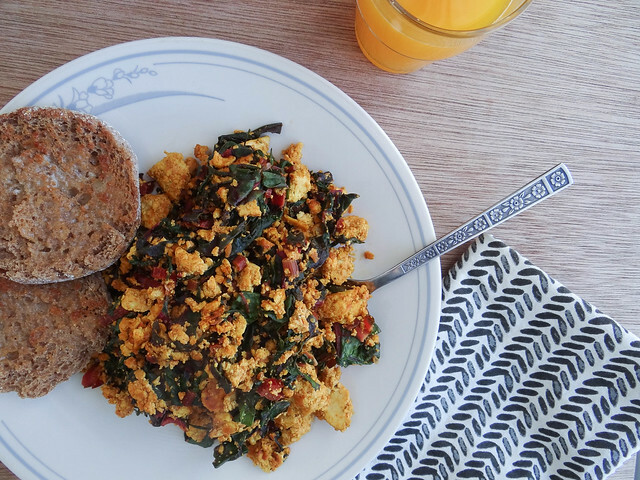 For an extra firm tofu scramble I use extra firm sprouted tofu from Wild woods, for a softer scramble I like to use firm or extra firm tofu from Nasoya. 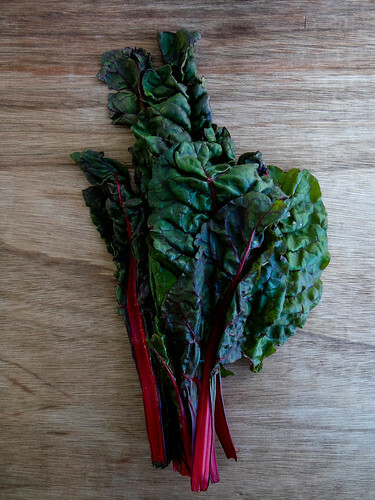 I absolutely cannot wait until summer; I always grow Swiss Chard and last year I grew Ragged Jack Kale which was a huge success and plan on growing both once spring hits. 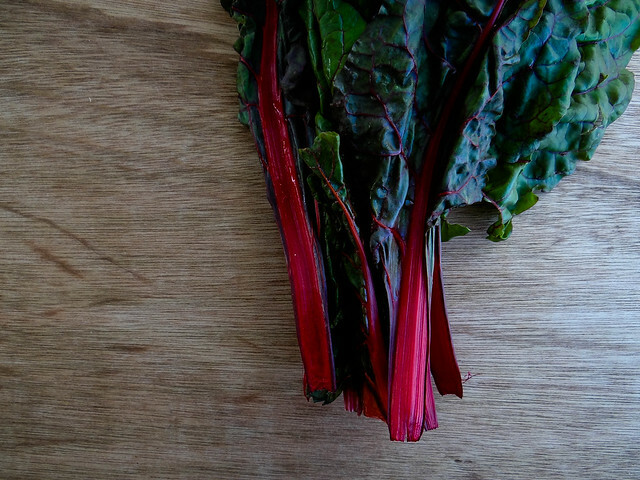 Typically I always have baby spinach on hand, however on my last trip to the market I spotted some beautiful Swiss Chard that I just couldn't resist. My tofu scrambles always consist of tofu "eggy" base, a hearty green & salsa. Someday, when I open up my dream vegan cafe & bakery this will definitely be on the menu. As I write this post we are receiving yet another round of snow, this past weekend we had our first real taste of spring (woo hoo for 40 degree weather!!) which made it feel like Spring was an actual possibility and not just a far away dream. We are anticipating another 10-12 inches of snow from this current storm front, I guess that means I will simply have to continue day dreaming about the garden, it will give me a little more time to formulate the garden plan which is on the Sunday to do list. On a positive note there will plenty of the fluffy white stuff for a good snowshoe hike this weekend! 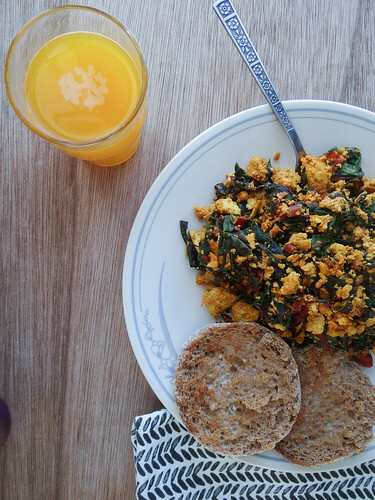 What is your signature tofu scramble? Any must haves that make your scramble the ultimate scramble? Over medium heat add all seasonings except salsa and mix well- cook for 1-2 minutes. Add Salsa and mix, cooking an additional 2 minutes or so. Add greens and cover until wilted, about 2 -4 minutes or so. Lift cover about halfway through cooking and give it a stir to ensure scramble is not sticking to the bottom of the pan. 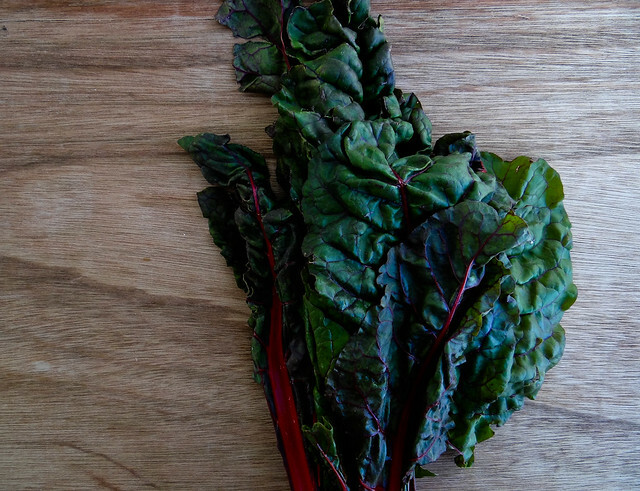 Remove from heat and serve with sprouted toast or English muffin! I grow up eating tofu and soya products..this is a perfectly delicious and healthy lunch idea. Overall it is pretty healthy! Holy goodness!! This looks like such a nice meal for annnnny time of day!! I love it! Thanks Katrina, it is one of my favorite breakfast's! I usually just use whatever I have on hand or vegetables that need to be used up. Last week I did kimchi, green onions, shallots, turmeric + coriander, which was a really nice scramble variation! LOVE the idea of adding Kimchi, that is totally on my list to try this week- thank you for the inspiration! I use cauliflower and spinach and lots of Indian spices. 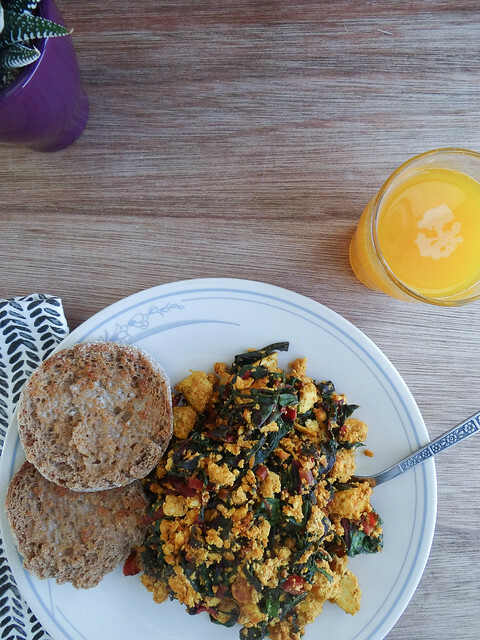 Tofu scrambles are one of my favorites! Yum I would never have though to add cauliflower- the the Indian twist! 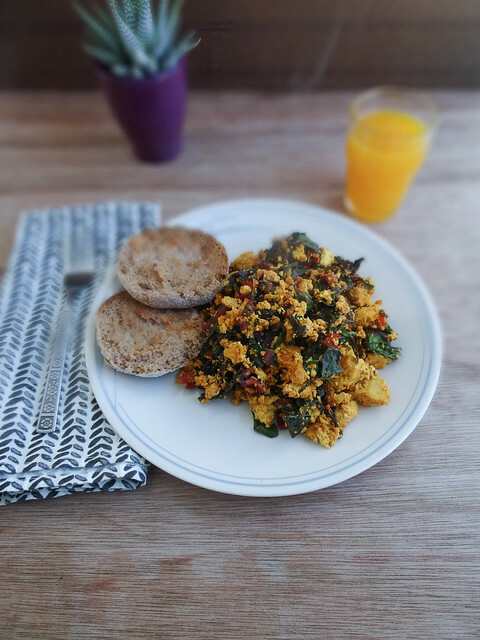 That's it, next time I am actually home at a breakfast hour (probably not till this time next week...silly working at 7am...) I am totally making tofu scramble! I've been craving it lately and this just cemented my need for it! I hear you on the weather front- we got up to 10C only to see 15 cm of snow the next day then -30C temperatures the day after that. What is going on???? Thanks Uru, I sure do love it in the am! Your scramble looks so good!! I love all of the greens in it. 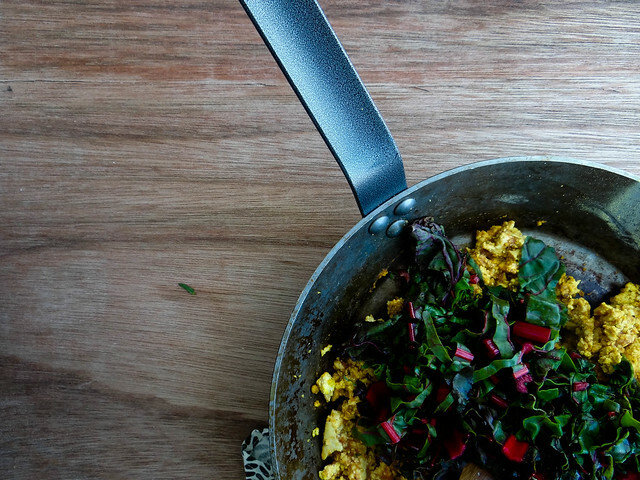 I like a very vegetable-heavy scramble. We are in total agreement in terms of tofu. I either use Wildwood or Nasoya, depending on my mood. Sorry to hear about the snow! We have snow in our forecast too, after a few days of weather in the 40's & 50's. Hopefully it will pass quickly! At least there are birds chirping outside my window right now. It gives some kind of assurance that spring is imminent. Thank goodness the snow storm pretty much turned into a rain and ice storm and melted away quickly!!! I know what you mean about the weather - winter just refuses to go away, but we'll get random warm days to hint at spring...I hope it comes for good soon! 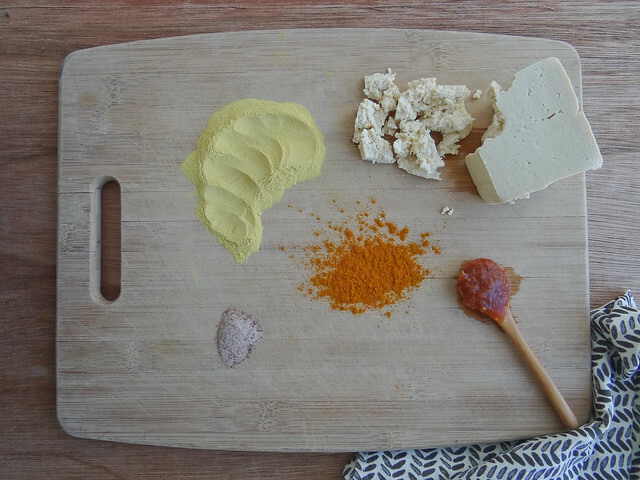 I agree on the turmeric for colour and nutritional yeast for cheesiness in a tofu scramble. I've heard of adding black salt for a more eggy flavour - I'll have to try that sometime! Love the idea of mixing in salsa too, instead of eating it with ketchup like you would regular scrambled eggs...pesto is a good option too!